It is low season. This is the time many take advantage of thelow-season vacation deals while others miss out by staying home. Maybe those who chose to stay home fear hurricane season or it is simply because they don’t want the chance of rain to spoil their sunbathing time. Regardless, there is one more natural phenomenon that takes place this time of year, crab invasion. No, it is not a reason to avoid travel but it is absolutely fascinating and rather endearing. It happens every year during the low-season months. Crabs abandon their watery homes and migrate inland for dryer habitats. It is not because the spring breakers have returned to class and things have quieted down. Rather, it is because crabs have an innate ability to sense when stormy weather may be the horizon. It is as if they have been born with internal meteorologists that inform them when to leave the sea and seek shelter. 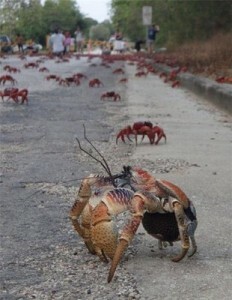 The migration of crabs doesn’t necessarily predict a hurricane 100%. They simply sense that it may occur. 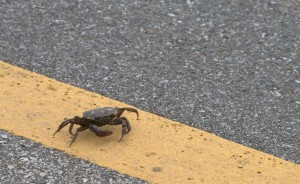 However, recently there has been an increase in the number of crabs crossing the streets, invading parking lots, and residential areas. Scientists blame hurricane Alex. Alex came close to the shores of the Yucatan Peninsula only to deposit a bit of rain and wind before moving north. 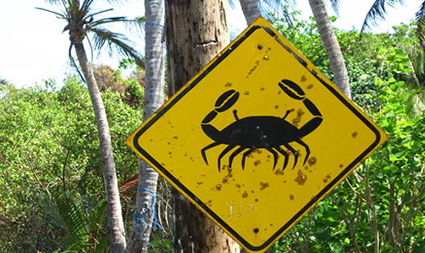 This signaled danger to the crab population. In some cases, traffic has been put to a halt for crab crossings and children and families can be found carrying buckets of crabs transporting themto safer grounds. Anyone living or visiting the area must take caution while driving or biking. The crabs are not at all dangerous. If anything, this annual migration should be a reminder to us of the captivating fragility and complexity of our ecosystem and the importance of preserving it. Anyone who lives in Cancun or the Riviera Maya or anyone who is here on vacation will be lucky enough to see it.